Sales, a coupon code and more of The Alter Mysteries! I have some goodies for you guys. First, the next flash fiction post of The Alter Mysteries: Death Shadow is available on early access for $3 patrons and above on my patreon. Don’t worry, the post will be free on Sunday, but if you can’t wait, feel free to tip me for my hard work and become a $3 patron. For those of you who do contribute, thank you for patronage! I can pump out more content, because of your support. Speaking of work, guess what? My shop has its first coupon available! The coupon is my gift to you in honor of Father’s day and Pride month. The coupon code is “gift10” (without the quotations marks) and can be applied to full priced merchandise only. That means you can get ten percent off my art, iPhone cases, and clothes. Aside from the coupon, there is also a sale on many items including my totes and pillows. The sale and the coupon both expire on Father’s day. Hurry and get your shop on before the sale is gone! Thank you for following my blog guys! Feel free to leave questions and comments below! Keeping track of our goals with creative endeavors can sometimes fall out of line with our inspiration. The last time I wrote an update about The Dark Prince was May 8th, since then my plans have changed in unexpected ways. 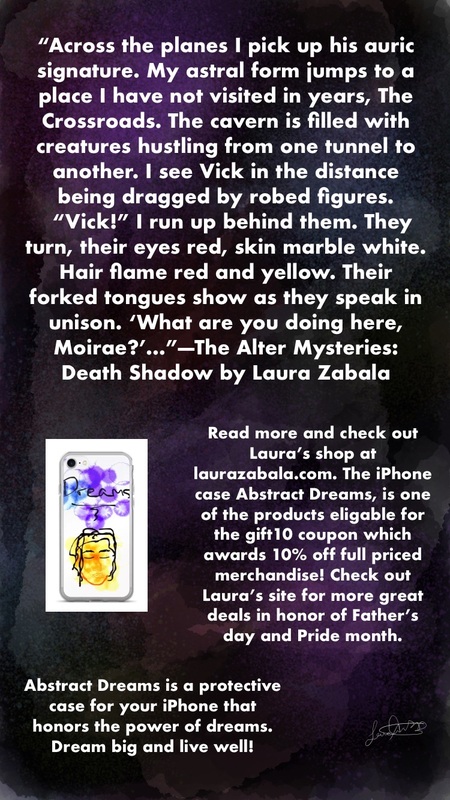 I wrote far more for The Alter Mysteries than expected and opened a shop that sells posters, mugs, and other goodies. As a result, I am woefully short of my word minimum for May. My word count has gone up to 12,242 words, which is 7,758 words short of my 20,000 per month goal. However, recognizing where I have come short can go a long way toward getting myself back on track. Analysis of what was done well and what needs attention can help get a creative back on track. Many creatives know that moment of intense inspiration where you can’t help but make what comes to you. The muse took me and forced me to write more of The Alter Mysteries. The ideas were so intense I could not stop writing. I feel that is a win. Since I plan to publish, The Alter Mysteries: Death Shadow, as a book. However, The Dark Prince is a book I want to publish on its own. Sooner rather than later. I want to prove to myself that I can write flash fiction while simultaneously pumping out books. Since I have been productive I won’t punish myself for the low word count on The Dark Prince. However, this post is me reevaluating my metrics and refocusing on my goals. Creatives should review their goals and where they are in regards to meeting them. Granted sometimes you have to adjust plans and forgive yourself from taking unexpected detours. If I can manage to finish the month meeting my 20,000-word count for The Dark Prince – I consider that a win. If not, then I did well enough by writing at all and working toward my goals. Being productive in itself a great accomplishment – it is better than having no word count at all. Once an evaluation has been done of where you fall in terms of accomplishing the goals you set, now it is time to go about improving in the areas you fell short. By June 1st I will attempt to bridge the 7,758-word gap. A big goal, but one worth working toward. The more momentum I can put towards writing my book the better. I want to have a working first draft in my hand to tear apart and gripe over editing. As my word count goes up my thoughts go toward beta readers. Every time I reach a milestone I am already thinking up what will I do next. Sometimes it can shift focus away from what’s important, but this check in I do with my word count helps me go back to basics. Once the evaluation is done, and a creative sets up new goals based on what needs work, now it is time to focus on what was done right. As a creative, producing results, you deserve a pat on the back, yes? This month I have been releasing new posts for The Alter Mysteries consistently, writing my book, and even opened a shop. I have been productive so I plan to treat myself by doing something I enjoy. Purposely going out of your way to reward yourself for doing work is important. Just like a good company rewards its employees, you should reward yourself for working hard. Rewards are a way of incentivizing yourself to go above and beyond to meet your goals. Just remember that output isn’t always necessarily about volume, it’s about quality too. That is why we stop and check in to see where we are with things, not just by measuring our accomplishments, but taking a look at how others have responded. Did you get more followers? Has anyone taken the time to appreciate your work? It’s okay if no one has yet, but don’t forget that quality is extremely important. Do you have any tips for reaching creative goals? If so, feel free to share. As always, thank you for reading. Many of us have that moment when we commit ourselves to a goal that feels impossible. For me, that high goal is publishing books. I decided that I would pick one of my books in progress to publish by fall of 2018. The Dark Prince is my pick. I will share regular updates on my progress and thoughts. Right now, The Dark Prince has 11,297 words. I have to produce roughly 20,000 words a month to finish a rough draft of approximately 150,000 words by January of 2018. My goal will be broken down by the week. Every week I need to write at least 5000 words. Along the journey of publishing my first book, I am working on solidifying my author identity. What genres do my books fit in? How long will I continue to write The Alter Mysteries: Death Shadow? What are the common content and grammatical issues my work exhibits? How can I improve my product? I am following fellow writers who give tips on how to improve your writing, like Joanna Penn at her blog, The Creative Penn. Even the use of programs like Grammarly can help with honing the writing craft. With every question, I search for a solution. We might not get all the answers we seek quickly, but patience is a huge component of passion. Sometimes what we pursue is not easy, but by doggedly pursuing our goals we achieve knowledge that can help us along the way. Whenever I feel confident about my work I go back to edit it again. In my opinion, a dose of humility goes a long way toward improvement. Criticism can be used to make our craft better. Few people would be amazing right out the gate with their craft. Perfection is an impossible result, but making things the best we can is within reach. A part of my process is holding myself accountable by doing research, listening to feedback, and posting my goals publicly. Maybe you can work towards your goals too by breaking them down into simpler steps day-by-day. Asking yourself what you can do to improve is a crucial part of making your dreams reality. If you have any questions or tips, feel free to leave a comment below. Thank you for following my blog.